Will Donald Trump Be America’s First ‘Post-Imperial’ President? 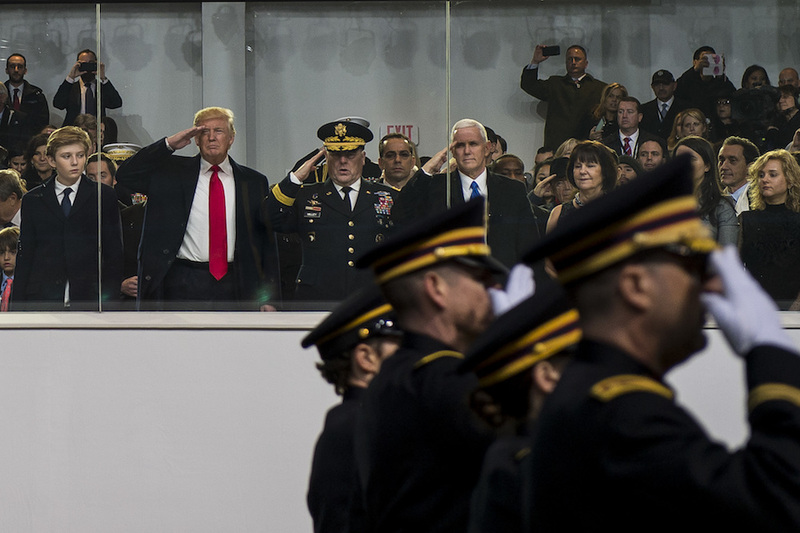 President Donald Trump, Gen. Mark Milley, and Vice President Mike Pence at the inauguration parade. Photo courtesy of Wikimedia Commons. In a forthcoming book, I argue that the United States has been an empire ever since its birth as an independent country, that the empire ceased to be based on territory after World War II, and that the empire is now in retreat. If all this is correct, then it means that at some point the United States will have its first post-imperial president. So it’s worth asking: What would such a presidency look like? And by what criteria would we know that a future president was really post-imperial? The foundation stone of the U.S. empire is a belief in American exceptionalism. This nation, it is argued, is not like other imperial powers that have acted selfishly and amorally—or even immorally—abroad in pursuit of the national interest. Since it took lands from European, Latin American, and Indian nations, the United States has portrayed itself as a “force for good” that is driven by different motives in its foreign interventions than those of other great powers. Thus, U.S. presidents since World War II have always preferred to talk of America as a “leader” or as “indispensable” rather than refer to it as an empire. A post-imperial president would therefore have to accept that the United States is no longer exceptional, that its actions in other parts of the world have not been significantly different from those of other imperial powers in the past, and that its motives have been venal on many occasions. These views resonate with a majority of millennials today, and with a large number of older voters as well, but no president so far has been willing to articulate them. And this political challenge would be only the first of the problems facing a post-imperial president. It’s true that the territories of the American empire have shrunk significantly—either by absorbing them into the United States as states, or by granting them independence, leaving Puerto Rico as the largest of those that remain. In spite of this, the semi-global empire constructed after World War II still remains in place. And the basis for this empire, now increasingly questioned inside and outside the United States, has been the control of global and regional institutions, coupled with strong support from non-state actors such as multinational companies, think-tanks, philanthropic foundations, the media, and religious organizations. Most of these global and regional institutions are still in existence—including the United Nations Security Council, where the United States has a de jure veto; the World Bank and the International Monetary Fund, in both of which the United States has a de facto veto by virtue of the size of its shareholding; the World Trade Organization, the agenda of which the United States controlled until recently; and the North Atlantic Treaty Organization, of which the United States remains overwhelmingly the dominant member. There are also regional bodies such as the Organization of American States and the Inter-American Development Bank, in which the United States maintains a predominant role with a de facto veto. Yet other countries increasingly resent the in-built advantages enjoyed by the United States. In some cases, nations, notably China, are taking steps to build alternative organizations. A post-imperial America would have to accept a loss of privilege and therefore a reduced status. At the very least this would require the dilution of its veto in the Security Council by all five permanent members—if not its abolition—as well as acceptance of the loss of a veto in other global institutions. The United States’ role in NATO would also have to be reconsidered—if not ended. This organization, designed for security in the North Atlantic region during the Cold War, has become an instrument to project power globally. Complemented by nearly 800 U.S. military bases, NATO in its present form is wholly inconsistent with a post-imperial role for the United States. Furthermore, its members have become skilled at dragging the United States into their own conflicts, knowing that only the United States has the military power to make threats credible. By contrast, a post-imperial president would not necessarily need to abandon nuclear weapons, since the Treaty on the Non-Proliferation of Nuclear Weapons (NPT) “only” requires nuclear weapons states to phase them out without a deadline being imposed. If and when other nuclear-armed states move towards ending their current monopoly, however, a post-imperial president would need to move in the same direction. Finally, a post-imperial president would need to ensure that the United States participate in those global organizations and treaties of which it is not currently a member on an equal basis to other states. This would include all environmental organizations concerned with tackling climate change as well as bodies concerned with international human rights and international justice. Congress would also be required finally to ratify those treaties that have remained “unperfected” for many years, such as the Convention on the Elimination of All Forms of Discrimination against Women (CEDAW) signed by President Carter (1977-81) in 1980 and still not ratified after nearly 40 years because of its strong defence of reproductive rights. A post-imperial president would therefore have to accept that the United States is no longer exceptional. No administration since World War II has come anywhere close to meeting these criteria for the first post-imperial presidency. And it would have been completely unrealistic to expect them to do so while the U.S. empire was in its ascendancy. Indeed, President Bill Clinton was quite explicit that the “unipolar” moment provided by the end of the Cold War created an opportunity for the United States to rewrite the rules of international politics so that it would be comfortable living in a world in which it was no longer hegemonic. President George W. Bush was equally forthright if less articulate about this. Barack Obama is the first who could seriously be considered for the role of a post-imperial president. He pushed the United States to participate fully in a number of organizations and treaties in which it did not have special privileges (notably the Treaty of Paris on climate change). He was also clearly preparing the ground for a time when the United States would have much less leverage in the world and wished to use his influence, as in the case of the nuclear agreement with Iran, to maximize its fading imperial power. But Obama—despite some ambiguous statements at the beginning—ultimately proved to be a true believer in American exceptionalism, fiercely resisted a dilution of American institutional control, and remained firmly committed to expanding NATO under U.S. tutelage. So far, Donald Trump may have come the closest to being the first post-imperial president when, during the campaign, he questioned the use of the word “exceptional” to describe the United States and subsequently put in doubt American commitment to NATO. Furthermore, his slogan “America First” has been interpreted by many as a sign that the nation is no longer willing to provide the global public goods in return for which it received broad support from its imperial vassals. However, his message of “Make America Great Again” has such a strong imperialist undercurrent that he could never be described as post-imperial. The runners-up in all recent presidential contests have also been very much in the imperialist mode. John McCain (2008) was a traditional imperialist. Mitt Romney (2012) was more nuanced, but still undoubtedly an imperialist, while Hillary Clinton (2016) was quite explicit in support of American empire. Only in the primary contests have candidates emerged with the potential for the label “post-imperial.” The strongest such candidate has been Bernie Sanders, whose questioning of American exceptionalism in the Democratic primary contest in 2016 suggested that a post-imperial message is starting to resonate inside the United States. Does this make a post-imperial president possible anytime soon? Much will depend on the performance of the world economy and America’s place within it. That China will overtake the United States as the world’s largest economy is not in doubt (China is already the largest in purchasing power parity). But the speed of U.S. decline, relative to China and other powers, will be important in determining how Americans themselves transition to post-imperialism. And if the U.S. economy becomes better at distributing income and wealth more equally to its citizens, there may be less reason for voters to question the current imperial status. But with the empire so clearly in decline abroad, and the social fabric tearing at home, I would be very surprised if the United States reached the middle of this century without having elected its first post-imperial president. This president will need to manage imperial retreat while maintaining the optimism and confidence of the voters. This was the role played by Harold MacMillan in the United Kingdom, Charles de Gaulle in France, and—much less successfully—Mikhail Gorbachev in the Soviet Union. Who will step forward in the United States? Victor Bulmer-Thomas is an associate fellow and former director (2001-2006) of Chatham House, Royal Institute of International Affairs, and author of Empire in Retreat: the Past, Present and Future of the United States (Yale University Press, 2018). Empire, Imperialism, Obama, Post-imperialism, presidents, Trump, U.S.